March 17, 2017. The wedding day portraits are always a fun time with Brads Creative Images. 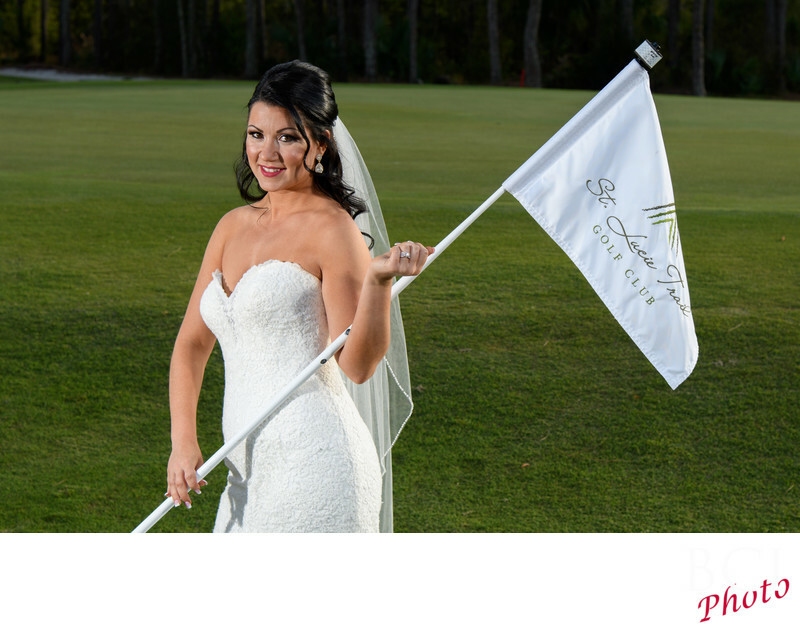 Here our lovely bride was clowning around near the 9th green at The St Lucie Trail Golf Club in Port St Lucie, Florida. She was having a fun time, and we just kept on shooting. What you may not notice here however, is the exposure. Thats ok, thats how we wanted it to appear. Natural. But..its the farthest thing from it. See we dont leave the exposure to chance. In this image, the sun was strongly shining from the right side. A natural light only shot, would be forced to either: leave her face in the resulting shadows...or expose for the darker shadow area of her face, which would have resulted in the background looking blown out. Instead....we used our professional on location lighting to simply augment the great light mother nature provided from the right, with a little love from the left to balance her exposure with the existing natural light. Voila! A perfectly natural looking and fun image. Lighting makes the difference folks. Want your wedding images to look just like this? Call us now. Dates are limited.